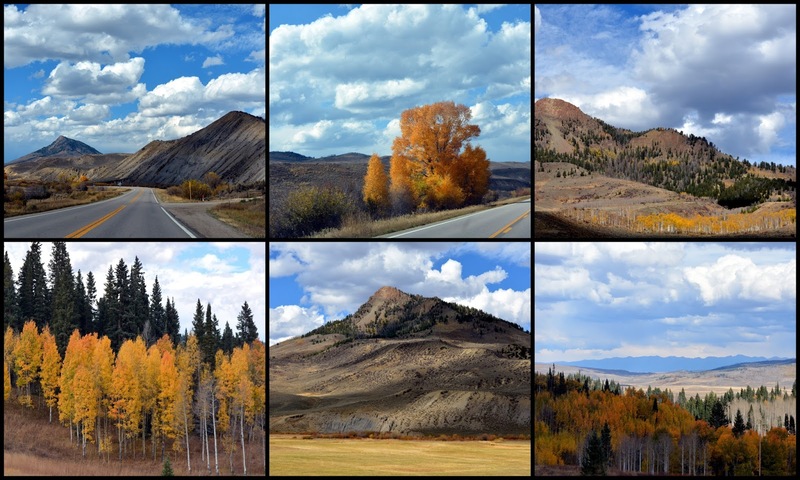 It was early October, and we thought we might have already missed most of the autumn color, but we were pleasantly surprised to see there was still many areas that had a beautiful warm autumn glow. As usual, I snapped photos as my husband drove. ...some of it reminded us of the badlands in South Dakota or the Painted Desert in Arizona. ....as well as fertile valleys that contained rivers and large ranches. We drove over Rabbit Ears Pass towards Steamboat Springs. Although not as high or treacherous as many mountain passes, it is often closed for a time in winter because of heavy snow. Again, as we approached Steamboat Springs, we saw many ranches and lots of hay making going on. 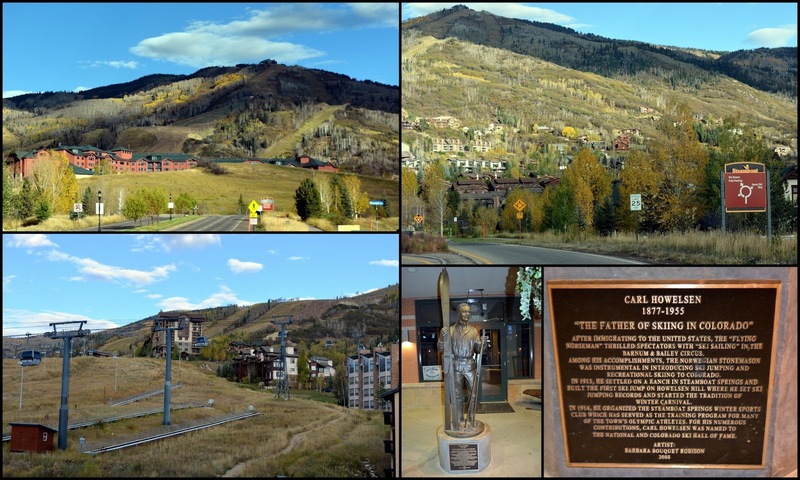 Steamboat Springs is an internationally known winter ski resort town. Steamboat Springs contains the Steamboat Ski Resort, which is located on Mount Werner, in the Park Range east of Steamboat Springs, and also the smaller Howelsen Ski Area. If you click on to enlarge the photo collage above you can see a statue of Carl Howelsen in downtown Steamboat and read why he is called "The Father of Skiing in Colorado," as he introduced ski jumping and skiing to Colorado in 1914. The Howelsen Hill Ski area has sent more skiers to international competition than any other area in North America and has been the training ground for more than 64 Olympians making over 90 Winter Olympic appearances. My husband and I enjoyed the town of Steamboat Springs and found so much to do there! We arrived on a Friday afternoon, and after checking into our hotel we walked up and down the downtown main street, looking in the shops, and a few of the many art galleries. We also walked along a portion of the very scenic 7.5 mile Yampa River Core Trail that runs through the heart of town during our stay. During the warm summer months there are often tubers floatimg on the river. There were many wonderful restaurants in town, and we celebrated the actual day of our anniversary with a gourmet meal at Harwigs--a Steamboat institution for 32 years. If you'd like to see what we ate, you can click on my Instagram on this link and scroll to the LEFT. I often update my Instagram account more timely than my blog, and if you'd like to follow me there I'd appreciate it. 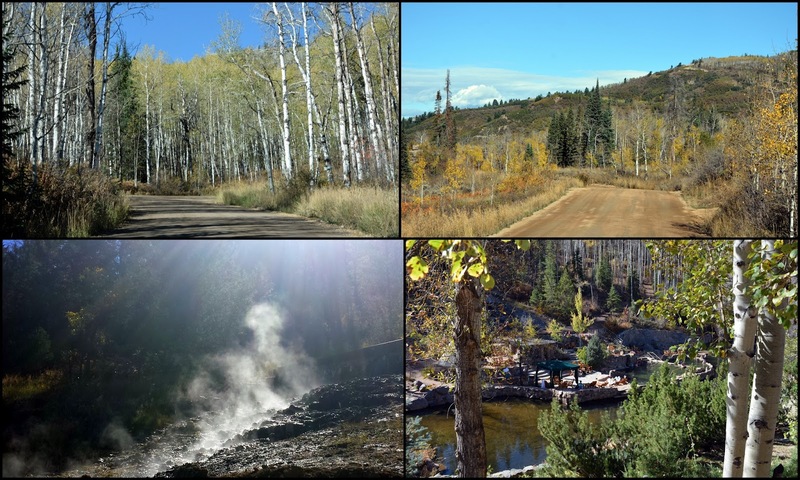 The Steamboat area has 150 geothermal hot springs that were revered by the Native Americans and pioneers alike. The name "Steamboat" was actually given to the town because a spring there made a sound that reminded settlers of a steamboat chugging down a river. Unfortunately, construction of the railroad in 1909 made the sound go away. In the heart of town there are the Old Town Hot Springs pools in a very modern facility, but we chose to drive to the more rustic Strawberry Park Springs a short distance away. Strawberry Park Springs is about a 15 minute drive up a mountain through some beautiful aspen groves. The last two miles of the road are not paved, so during certain months four wheel drive or snow chains are required. There are also shuttle services that will bring you to Strawberry Park Springs from Steamboat Springs. 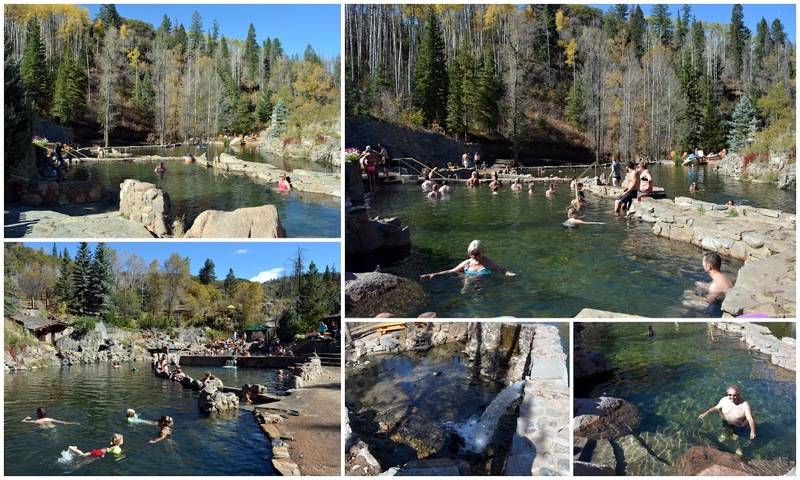 The hot mineral springs are open year round and are family friendly during the day but only those 18 years and over are allowed to use the springs in the evening, as wearing bathing suits are optional after dark. The hot mineral springs are contained in very natural looking pools. The 147 degree hot mineral spring water coming out of the ground is mixed with the cold Strawberry Creek water and channeled into the pools. The top pool is 105-106 degree F, and as the water flows toward the two lower pools it cools two degrees in each one. The steaming hot mineral water that flows beneath the rocks keeps the area warm, even in cool weather. The pools are drained and cleaned every week. If you look at my husband standing in one of the pools in the lower right of the collage, you can see how the water is crystal clear. The hot spring water felt so delightful! We stayed in the hottest pool for most of our visits as it was so relaxing. We would stay in for about 15 - 20 minutes and then get out and lay in one of the lounge chairs, repeating this routine many times. We stayed a few hours during the day over the weekend and did not participate in the bathing suit optional evenings. Facilities include restrooms, heated cabin for changing and picnic areas. There were private areas for massage and Watsu aquatic therapy. No smoking or alcohol or pets are allowed. Strawberry Park Springs is truly a beautiful setting and a fabulous experience to enjoy! It, and Steamboat Springs, made the second part of our anniversary celebration truly memorable. We did more activities while in the area, but they will be saved for future posts. Colorado seems limitless in its beauty and availability for a variety of natural experiences. I feel very fortunate to now live here after enjoying New York City for most of my life. It feels as if I've enjoyed the best of two worlds! Thank you all for your wonderful best wishes on our 41st anniversary. I sometimes feel like it is impossible that so many years have passed, but I am so pleased that our years together have been happy ones, and I hope and pray we will be blessed with many, many, more! Built in an Italian Renaissance style in 1918, the Broadmoor main building is situated by man made Cheyenne Lake at the base of Cheyenne Mountain, at an elevation of 6,230 feet. The resort is made up of hotel, conference, sports and spa buildings. Historically, national and world skating and hockey championships were held at the Broadmoor World Arena, and Golf Championships have been held at the Broadmoor Golf Club since 1921. 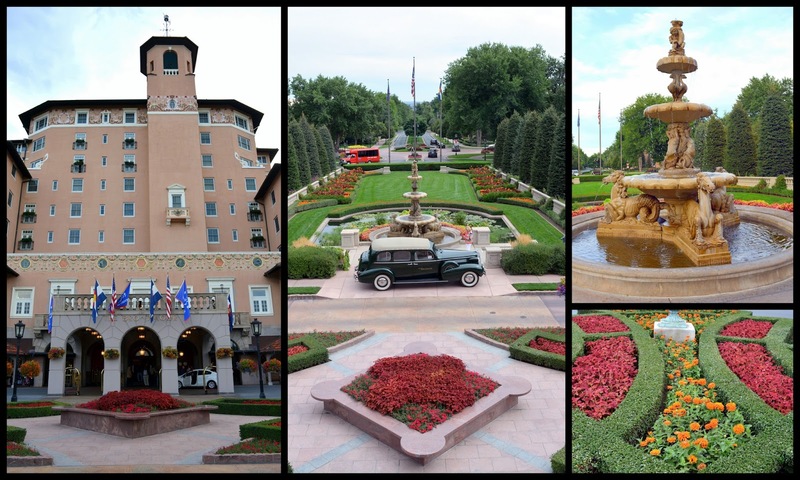 Original owner Spencer Penrose built the Broadmoor to be one of the finest hotels in the United States. He hired architects Waren and Wetmore, who had designed the Ritz-Carlton and Biltmore Hotels, and also Frederick Law Olmsted, the father of landscape architecture, to design the landscape for the hotel's 3,000 acres. Penrose also hired Donald Ross, a golf architect, to design the original golf course, which was once the highest golf course in the United States. After Penrose's death the ownership of the resort and hotel passed hands many times, and is now owned by the Anschutz Corporation, since 2011. The view we had from our hotel room. ...as well as many scenic views during our stay. The grounds, buildings and facilities were very well kept and so beautiful! My husband and I enjoyed the indoor and outdoor pools and relaxing in the whirlpool hot tub. 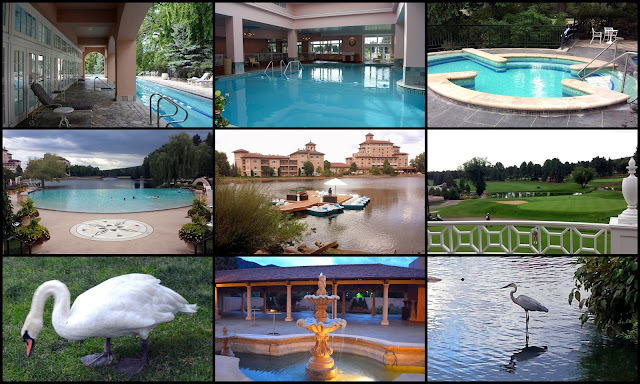 There were paddle and electric boats available to ride on the lake, and of course the ultra manicured golf courses and luxurious spa treatments. 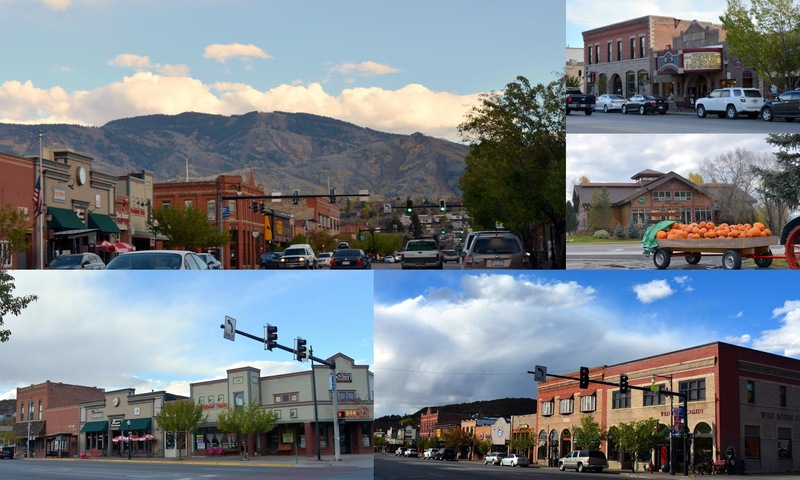 as well as tennis, horseback riding, and many tours and attractions in the area. The lake was filled with ducks, swans and an occasional visiting heron. 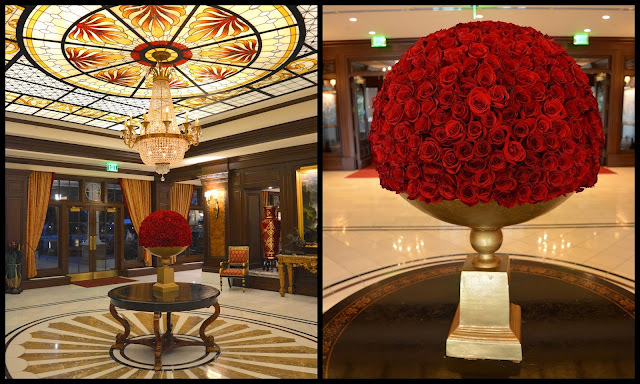 The interior of all the buildings was opulent in architectural detail, furnishings, and floral arrangements. There were many quiet comfortable seating areas among the many building lobbies. Every attention to detail was not spared. Just look at this vase overflowing with hundreds of red roses! 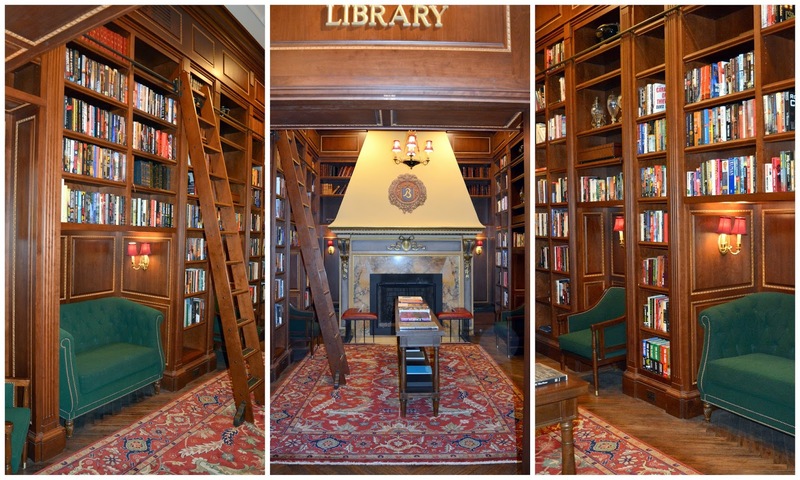 There was even a cozy and comfortable library in the main building. We enjoyed walking around the premises, just to explore the rooms and examine their displays. 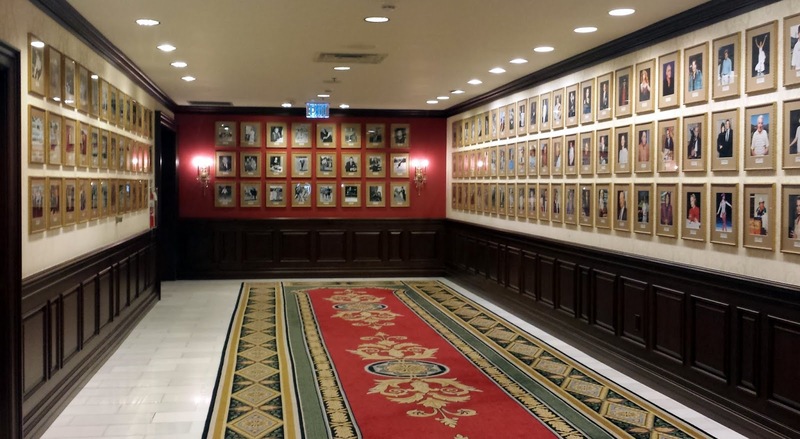 The Broadmoor even has its own bowling alley and movie theater for guests to enjoy! ...and those who are more contemporary. ...and an Alfred Beirstadt painting flanked by two Frederic Remington sculptures on the table in front of it, was in another lobby. 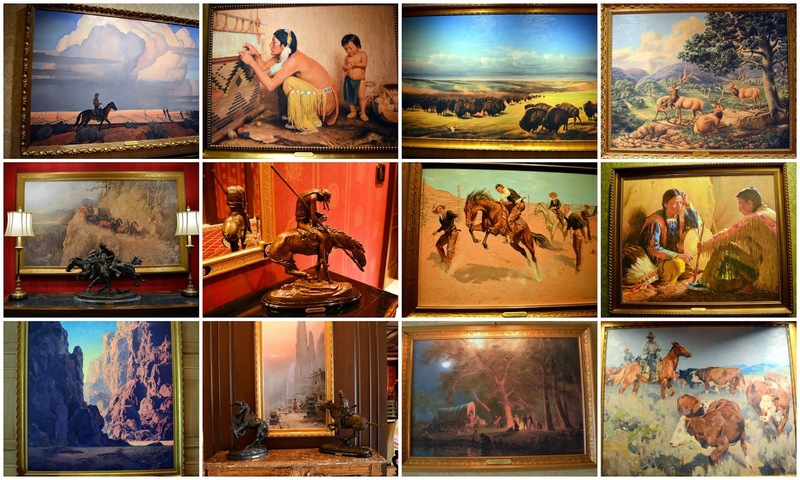 Remington, Parrish, Beirstadt, Fraser, Dixon, Sharp---the list of famous artists' artwork on the walls seemed endless. 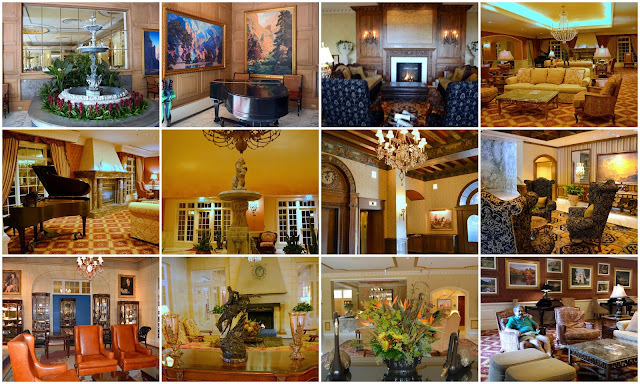 There were 26 retail specialty shops at the Broadmoor. 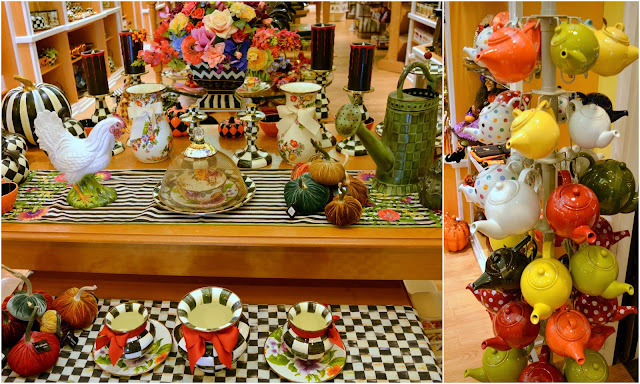 I was smitten with the pretty selections in this shop! 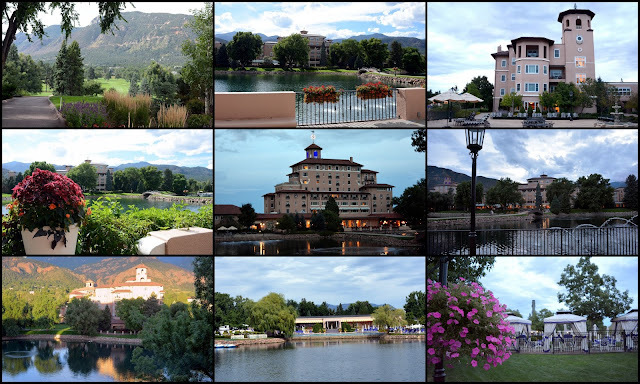 There are eleven restaurants and many cafes and lounges, at the Broadmoor Resort and Hotel, and we enjoyed meals at the English pub called The Golden Bee, the Italian Ristorante Del Lago, and the French restaurant, called The Summit. We felt the food was superb and so beautifully presented! 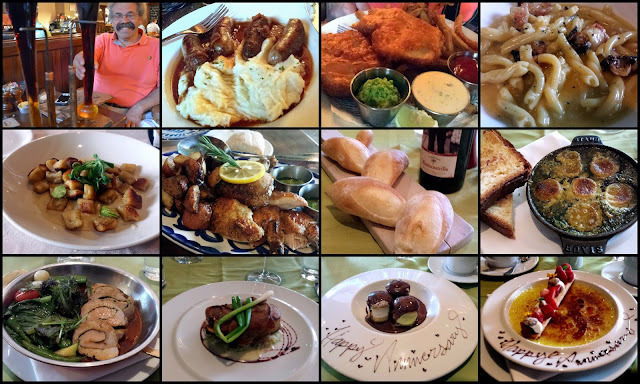 We usually no longer indulge in dessert when we dine out, but on one night we did, and the waiter knowing we were there to celebrate our anniversary made sure our dishes were sweetly decorated! 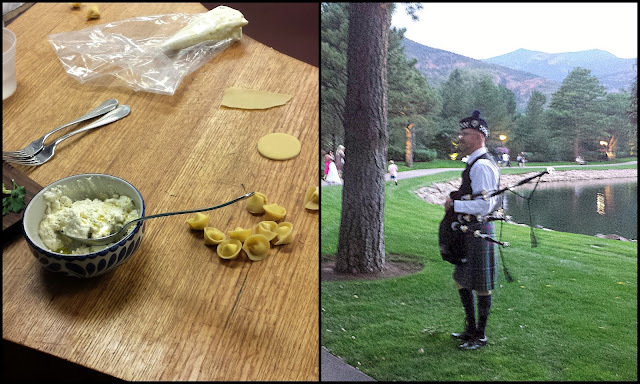 Two wonderful memories I have of our stay at the hotel was an afternoon tortellini and pizza making class taught by the chef at Ristorante Del Lago one day, and listening to the music of a bagpiper played every evening as he strolled around the lake. Of course we also spent some time off the grounds of the hotel, visiting the Garden of the Gods and the Seven Falls area, but I will save those photos for future blog posts. All in all, we were very pleased to spend this relaxing and pampering time at the Broadmoor Resort and Hotel. 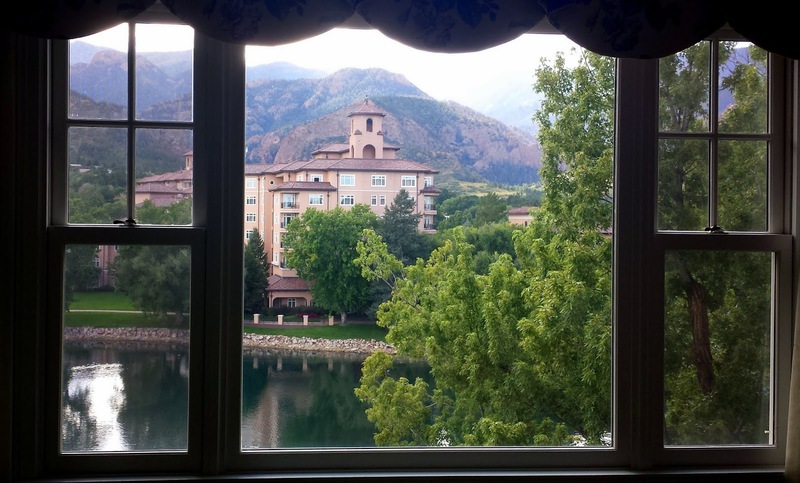 My husband and I made more wonderful Colorado memories here that we will always cherish. This was not the end of our anniversary celebration, however, as we also took a drive to NW Colorado on our anniversary date itself, to visit an entirely new place to enjoy--more about that amazing place on my next post! One of my readers from Australia, Diane, commented to me on my last blog post that Colorado must be the most beautiful state in the United States. I agree that it certainly is among the most beautiful, especially in autumn when the plentiful aspen trees here light up in shades of yellow and orange. 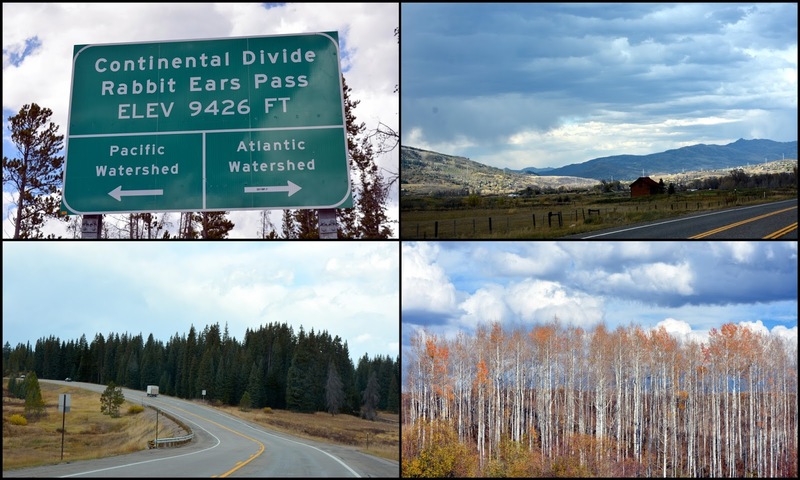 I took the following photos on a drive through Guanella Pass from Grant, Colorado to Georgetown, Colorado at the end of September. A former wagon road, this pass has been traveled since the gold rush days in the 1800's.You may remember I showed this beautiful drive last autumn on this post, but since every autumn is a little different I thought it would be nice to show some new areas this year. This 23 mile long high mountain pass is one of our favorite drives and we were pleasantly surprised to find that there has been quite a bit of road work done this year, where parts of the road that were gravel have been replaced by black top. Guanella Pass is still closed after the first heavy winter snow, however, as it is not fully plowed by the Colorado Department of Traffic. Some of the aspen trees along the road near Grant were just beginning to turn gold, while others were in full color. The weather was overcast but the trees glowed brighter the higher we drove. The summit of Guanella Pass is above the tree line at 11,669 feet. There are many trails in this area, one of which leads up to the 14,060 summit of Mount Beirstadt. and also the 14,270 foot Mount Evans, along with other trails that lead to campgrounds and lakes. The tundra plants in this area have taken up to 30 years to grow in the extreme winter cold and intense sunlight. It is interesting to see the differences that altitude has on what can grow in such a short growing season. This area can even get snow in July! The jagged Sawtooth Ridge connects Mount Beirstadt to Mount Evans. 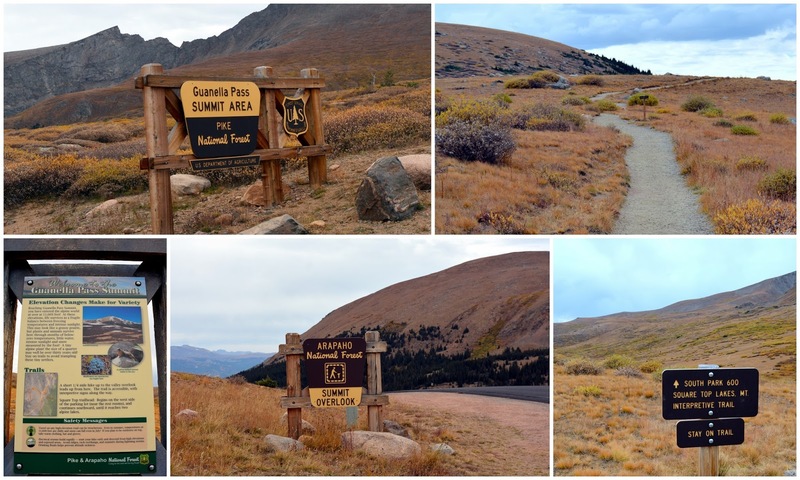 There are beautiful views in all directions from the summit of Guanella Pass. Portions of both the Pike and the Arapaho National Forests can be seen along the pass. 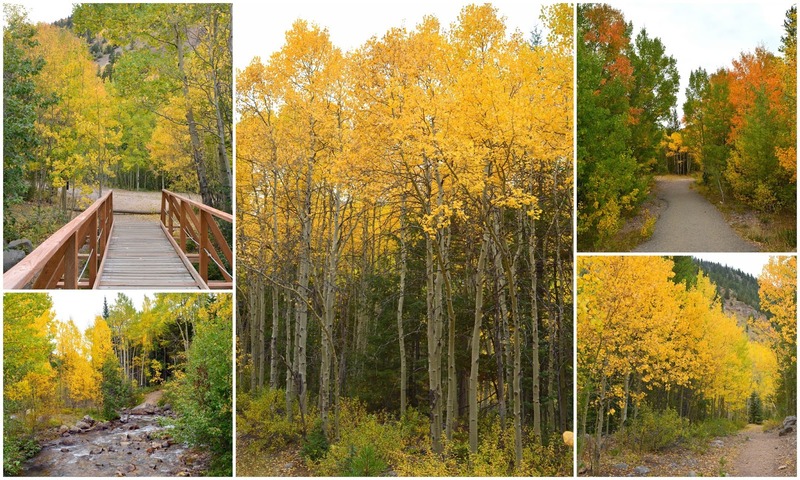 As we approached the Silverdale area of Guanella Pass the autumn colors were spectacular! 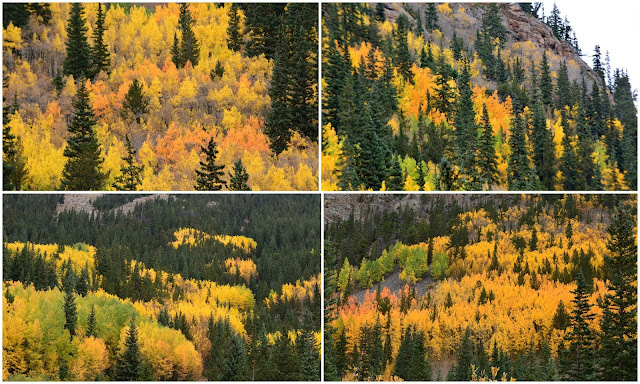 The aspens were really in top color in this area. If you'd like to see a short video of the sight and sound of a quaking aspen tree you can see it on my blog's facebook page here. Inter-spaced between the pine trees they make a beautiful stripes of autumn color on the slopes. We parked at the Silverdale pull off and took a walk. It's so peaceful here. As we walked we listened to the creek passing by the trail, and we were showered with the falling aspen leaves when a breeze blew many of them off the tree limbs. My favorite spot on this walk as it always makes me think of Robert Frost's poem "The Road Not Taken." What do you think? On this walk I took the trail on the left, next time I'll follow the one on the right. 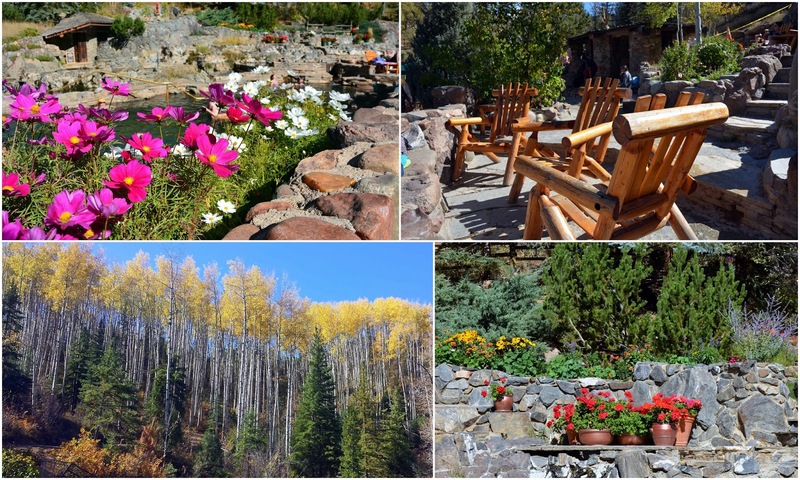 My husband and I recently celebrated our 41 wedding anniversary and we celebrated in two wonderful places in Colorado--one very luxurious and one very rustic and amazingly beautiful. Come back soon to see those posts!